My Legana bumper with yellow spots came today! Needs abit of re-furbing and spraying and fitting and new mesh. 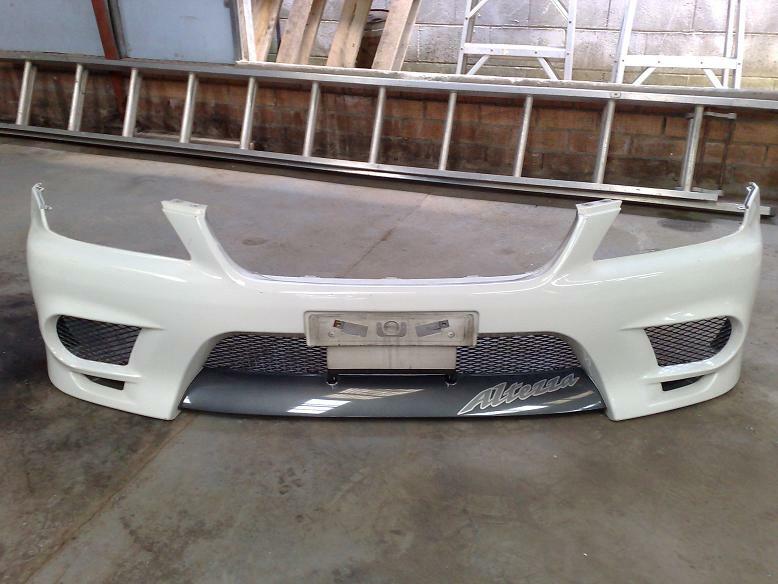 Hopefully this will be fitted before summer 2012. I'm gonna have the grill surround and middle bottom bar in a nice shiny carbon and my horns sprayed purple of pink to go with the wheels too. Can't wait. Dose anyone know where I can get a replica Altezza Legana sticker from? Like the one pictured here? were did you get the legana bumper from? Thanks, yeah it look like i'll have to get some made up, hopefully shouldn't be too hard. I got the bumper off eBay, was the first one I saw on there for like at least 6 months so I grabbed it whilst I could. So i got my banging cooling panel on, really need some purple washers to dress it up and complete it. I got some altezza stickers made up for my legana bumper ... just changed the colours. The place where i got it done still have it on their system so could get him to make one up if you still need. Its exact same size as original. I paid £25 for mine but says it would be cheaper for more now that its on his system if i ever needed more. I could ask for price if your intrested ?? in love with this....seriously nice tezza...fair play! Thanks d2carazy i'll try my best . wullie_trd cheers mate that sounds awesome, I would be interested if you could find out a price for us thanks . Can you message me a pic of your that you got done? Quick update, got me bolts to help dress the engine bay ready for the colour change, bloody expensive but look nice, need to buy more to do the full thing eventually. Also got some good advice when I fitted these that I though I could pass on, if you have bolts like these (stainless steel) keep a check on them every so often as stainless steel into mild steel can slip loose sometimes. Want to get some bonnet lifters next as my bonnet arm keeps falling out. A dab of mild strength loctite or threebond will help stop the bolts coming undone. They look very good I must say.